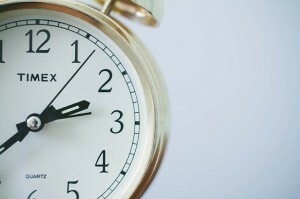 Home › General › Time Management – Is It Possible? A t-shirt slogan reads, “I was put on this earth to accomplish certain things. At the rate I am going, I will never die.” Have you felt this way too? Too much to do and too little time to do it is a constant refrain for most people. The stress it creates is wearing on our bodies and our relationships. Family and friends get short shrift as we tackle an increasing mountain of tasks. 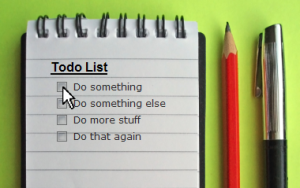 The tasks won’t go away, but they, and your time, can be managed better. Instead of going through life with a fire extinguisher and duct tape – putting out fires as they come up and patching problems – look at your life and tasks as a whole. Divide your responsibilities and interests into two –family and friends, and your job. In both cases you need to remind yourself of your priorities. List the two or three top ones. More will drive you crazy. Before you go home each day or first thing in the morning—whatever works best for you—create a list of what needs to be done. (For some this is best done on a weekly basis, for me it’s usually for today and tomorrow.) Pen and paper or digital doesn’t matter. Again, it needs to meet your needs. Subdivide them by area. For example, it might be classes (teaching and preparing), communicating (updating website, blogging, reports to administrators), and, hopefully, outreach (group or person you are targeting for collaboration and/or building a relationship leading to advocacy. Your personal list covers shopping, time with family (homework with kids, dinner out with spouse), and self-care (exercise, TV-watching, or whatever relaxes you – many of you know of my solitaire addiction). Place an asterisk next to the two most important items on your list. Then start your day. Although you might not get to them immediately, knowing they are most important, you will attend to them. You probably won’t get to everything on your list in the time you allotted. As noted earlier, too much to do, and too little time to do it and new things are always popping up. You are likely to find that some you didn’t get to become a high priority a bit down the road. That’s fine. If you need to, note what got in your way—a teacher or student needing immediate help that takes more time than expected or a crisis at home. Life has a way of upsetting our best plans.